I wanted to do the 15 Minute Challenge, but I couldn't figure out how. I have seven hours a day to myself - of course I can manage to find 15 minutes to sew! But then I realized how long the Steelers Quilt has been languishing without borders. And Frolicking Pinwheels? That's stalled because I haven't cut any 10.5" squares. That's the only reason. Not to mention the pile of mending that I never seem to get to. I didn't wear my favorite brown slacks at all last winter because I didn't make time to fix on hem. So maybe I don't need 15 minutes to sew. Maybe I need 15 minutes to sew on a UFO before working on something else. 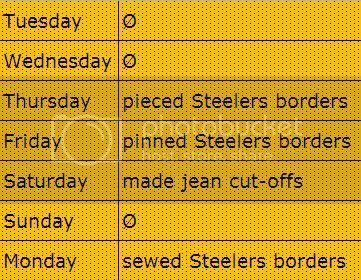 And just like that, the Steelers quilt is almost done. See how others are managing their time at Life in Pieces!